Heartbreakers and toetappers with a lot of the new songs the Wangfords are currently recording for the new album. So with luck Hank’s old heart will convert from the wild Elvin Jones drum solo and be beating regularly keeping him in good voice. 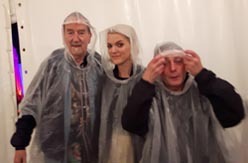 Come down to Crouch End and let Hank, Spanner and Lord Kevin wrench more tears from your dripped-dry ducts and laughter from your lungs. Hank Wangford, Lord Kevin Foster and Brad Breath (Andy Roberts). Hank and Brad and Lord Kevin go down to Malvern for a summer country festival. All sorts of goodies will be at St Peter's Art Church which you can see on the link below. 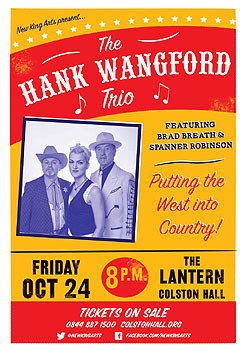 The Wangford Trio will offer up a mix of the best of some old favourites with many of the new songs Hank is currently recording on his new album. At all gigs there will be CD copies of Hank’s double 'SAVE ME THE WALTZ' album for sale. 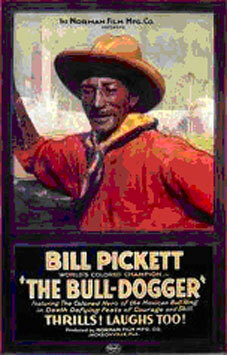 Click the image of Bill Pickett to read Hank's lyrics and see a few very rare images of Bill Pickett, The first Black Cowboy. Self self self! Hank has been so self obsessed in the last two months he’s missed on letting you know what’s new. Understandable, since just getting his cardiac reboot six weeks ago, getting more involved with the new album recording and then running away to Rancho Wangford to better enjoy the fiercest winds that Storm Gareth has to offer. And for winds – howling down the chimneys of the Rancho, blasting in off the wild Atlantic by the gate and screaming through the overhead wires – there’s nowhere to beat the Connemara coast. But back to you folks – pulling through assorted sicknesses that struck down the Wangford Bass Combo we had a glorious gig at Bungay’s Fisher Theatre when BJ Cole stepped in for the ailing Lord Kevin Foster and we harangued a warm partisan crowd with a bunch of fresh songs from the new album along with a smattering of oldies. Hank will come back from the Wild West this week to be ready for the Bass Combo’s return to the wonderful Green Note in Parkway, the hub of Camden in London. Come and hear Hank performing better than ever. The Cardiac Reboot looks to have done the trick and Hank – the Frankenstein of Alt Country – has risen from the moribund with his charge to the heart. The Reboot might even inspire the title of the new album… We’ll see. Crawling out of the Great Darkness, two in London one in East Anglia’s Waveney Valley. 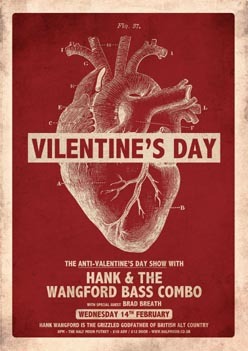 We start with the Wangford Bass Combo pouring Country scorn on the cloying sweetness of Valentine’s Day. So successful last year the Half Moon have demanded a return to the cutting edge of revenge. We've added some footage of Hank and Spanner's performnce at at the Ballintubbert for the Footsbarn / Glen Hansard festival in Ireland last September. See it HERE on Hank's YouTube page. 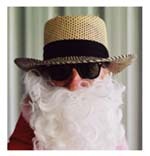 Now Hank is sparked up after his Full Moon birthday (born during the London Blitz of the Second World War on the Blood Moon – or Hunter Moon – from his Communist mother in a Nazi Stately Home) he is back for his Xmas presentations in Brighton and London. First he joins Brad for Yule Yodels in Brighton then back home for some London dates. He takes his Bass Combo to the wonderful Green Note in Southern North London’s Camden and to the deep North of Crouch End to the excellent King’s Head. In between he slips over Putney Bridge into the South London Badlands at the semi-historic Half Moon. Next month Hank goes back into the studio to lay down the tracks for his new album. Then he is back to Hammersmith Hospital at the end of January for another heart operation – another ablation – to ready him for the rest of the recording and the rest of 2019. We urge y’all to come and enjoy Hank, his new songs and old, in the full flush of his Atrial Fibrillation and wildly irregular heartbeat. Who knows – he might get boring with his new predictably post-op regular heartbeat. And who could resist a Fibrillating Country Singer? Hank will be Cerys’ guest sometime between 10.30 and 12 noon on Sunday 29th. Some years ago Hank presented a series of radio programmes on Radio 2 on Yodelling around the world called “Looking For The Lonesome Yodel”. Cerys wants to talk yodels with Hank as she shares his love of the universal yelp that transcends almost everything – time, space, souls, life and death. Tune in and hear yodels from Kalahari Bushmen to Mongolian long song. The single Jabberwock is one of RECORD COLLECTOR'S Top One Hundred psychedelic recordings of all time. Jabberwock and Which Dreamed It, written by Sam Hutt & Lewis Carroll, was released in 1968 by Parlophone Records. Both are featured in a new Cherry Red CD compilation of Psychedelia. Looking At The Pictures In The Sky – The British Psychedelic Sounds of 1968: will be released on 10 November. 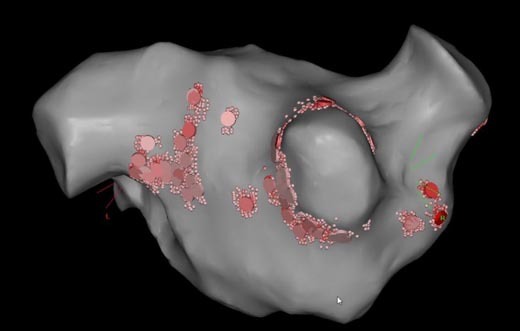 Here's a 3D image of Hank's heart with the burn out ablation spots marked in pink. These are the points where, with another electrode passed up from Hank's groin, they established the rogue points which were firing off electrical impulses which were confusing Hank's heart. This ​had ​sent him into the fast irregular rhythms called atrial tachycardia and atrial fibrillation. Another groin catheter snakes up into Hank's heart, punches its way from right to left through the middle wall and gets to work zapping the bad boys​ around the root of Hank's pulmonary vein​. So the pink spots are the burned out bad boys.... It may be modern techno but Hank thinks it's magic. 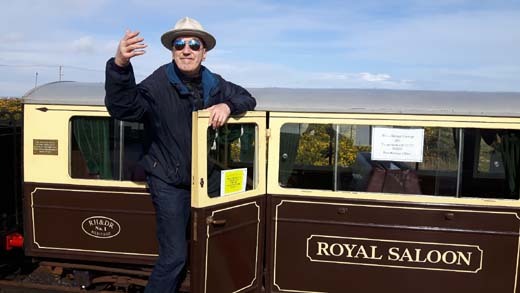 Hank was guest of honour at the legendary Romney Hythe & Dymchurch Miniature Railway, which he last visited as a child. 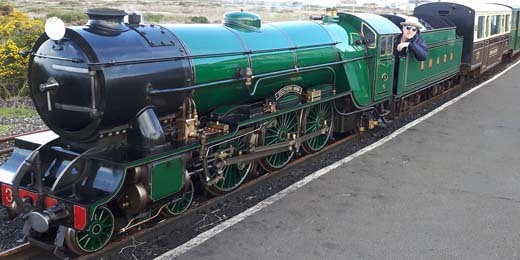 As a special guest he was allowed to 'sit' in the famous locomotive 'The Southern Maid' and enjoy a wonderful trip in the Royal Carriage on the Southern Maid - a treat indeed for the 'foreveryoung' Hank. Finally got Ablated last week. The cardiac surgeon had a new mapping kit to plot out all the electrical points, good and bad, of my old heart. Very flash and two Cardiologists from Denmark were guests. Once the rogue areas that had been pumping out the wrong rhythms were identified they were burnt out. Mapped and zapped. By special request they didn't destroy the Love Centre or the Misery Centre so I'll be back singing from the dark underbelly of Country Music by mid-March Lungs recovering after over three hours under the anaesthetic and groins healing from the catheter attack. All good at last in Rancho Wangford. Regular rhythm - what we call Sinus Rhythm - Rocks! As does the wonderful NHS in spite of all the attacks by our terrible government. 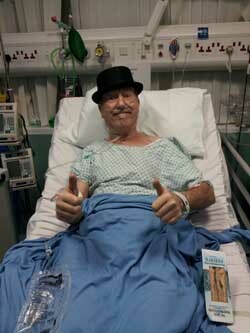 Here we are post op - note the NHS Salmon & Cucumber Recovery Sandwich. Lub dup lub dup lub dup! Hi Folks and Hallo 2016! Hope the turn of the year treated you well. Though we lost Lemmy before the New Year and Bowie just after I guess we should be grateful we’ve still got Willie Nelson and Merle Haggard in spite of all. What better way of navigating the dark underbelly of Country than with the thump and thud of twin bass guitars drilling their way through sad songs of lost love, breakups and betrayal, the malignant glue of relationships and the sticky end of the divorce court. Singing songs from the Dark Side of life is so much better down in the shadowy sonic world below 150 Hertz. Hank Wangford, the grizzled Godfather of British alt. Country, is joined by two bass players: Kevin KillaHertz Foster, the Jaco Pastorius of Country music and ex-Doll by Doll is the bass player of the Lost Cowboys. 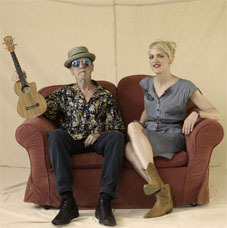 Spanner Subwoofa Robinson the new Chanteuse with the Cowboys and ex-bassiste of The Hallelujah Trails brings her heaven sent harmonies to Hank’s songs. Together the three explore Country from the bottom up, back to bass basics. The bass line in any song is mostly felt then forgotten and the Bass Combo seeks to home in on this unsung carrier of sad songs. The Bass Combo is joined by special guest Brad Bassbin Breath aka Andy Roberts from the Wangford 4. When misery’s that deep, for a Boombastic Country experience it must be the Wangford Bass Combo. Have a great Christmas and more importantly a happy, easy, friendly, prosperous and healthy New Year. Some of you may know - When Hank is not playing and promoting Country music I work as a doctor in Sexual Healthcare and Contraception. 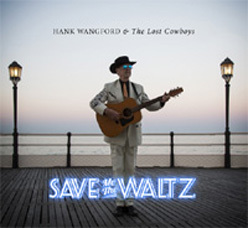 We've just added several more reviews of Hank's new double CD release, 'SAVE ME THE WALTZ' to the website. You can catch them HERE. We've just added a photo of Hank after a night's session (until 3am!) in Green's Bar in Kinvara on Galway Bay with three Greats - John Faulkner, folk & Irish music Titan, the inimitable John Prine and rising Irish star Declan O'Rourke. Great songs. Great singing. A welcome goodbye to the infamous Celtic Tiger. Visit the Gallery HERE. Hank visited the hallowed ground of Wembley to see his team win the FA Cup Final a few weeks ago. We have added a photo with him alongside Buster Bloodvessel of Bad Manners fame and Gaz Mayall (John Mayall's son). Visit the Gallery HERE.
" 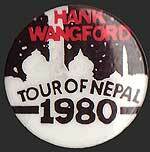 A Magnificent Night " is what the press said about Hanks 'Save me The Waltz' tour. We have uploaded a handful of gig reviews onto Hanks website. You can read the full reviews and see some photos from the tour HERE. 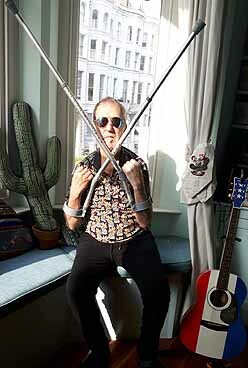 To coincide with the release of 'Save me The Waltz', Hank was interviewed by Paul Kerr and you can read the full interview HERE. The first reviews of Hanks new album, 'Save me The Waltz' are coming in and we have them on the MEDIA pages HERE. Hank will be out touring and promoting Save Me THe Waltz beginning this ocming week, when both the vinyl album and CD will be on sale at all the shows. New year new sickness? We hope not and that y’all are fighting off those wintry colds and flus and keeping the floods away from your doors. Here at Rancho Wangford the excitement creeps up as we’ve received the first handsome CD copies of the all-Waltz Save Me The Waltz double album. Once we get the vinyl 12 inchers it’ll be even more handsome. We are planning to officially release them on the week of Mother’s Day at the end of March. Watch this and other spaces for a major tour in May to see if Britain is Ready To Waltz!? 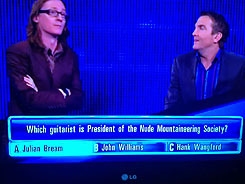 Cast your eyes over this tv quiz show screen-grab, brought to our attention by an avid fan, and see if you can answer the question! Now who can that person be? Our attention was recently drawn to an article in The Times newspaper about the Archbishop, Justin Welby, who goes Jogging each day and could possibly be a fan of Hank's suitably entitled piece - 'Jogging with Jesus'. Click HERE to see the article. Hank is still recovering from George Jones' death so it's The Colonel here to tell you of a couple of imminent appearances of my boy. He's finished recording his Double Waltz album and I have to say it's sounding good. Warm, fat and old-fashioned. There are a couple of tracks for you to listen to on the website to make your own minds up. Hank is now struggling with record company stuff - registering with PRS and MCPS and getting ISRC codes from PPL for all of the twenty five tracks. He's a bit down about it all and keeps complaining to me that he didn't sign up for all this. "I mean, acronyms are all very well but this is having a larf!" he moans. Just wants to write and make music, poor fool. I keep reminding him that it's a music Business. And how am I to get my 50% if he doesn't get it right? Later this week Hank is joined by Brad and Spanner for another visit to the Green Note then next week is back to the Half Moon with the complete Lost Cowboys. 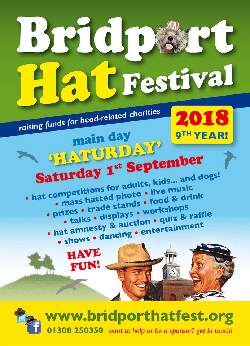 And now we're deep in the heart of Hat Season Hank will take Lost Cowboys old and new and a truckload of hats down to Bridport in Dorset to open the Fourth Bridport Hat Festival before Hank runs off to stick his head in some Irish sand out on the West at Rancho Wangford. Two tracks from Hank's upcoming CD 'SAVE ME THE WALTZ' are now on the site and free for you guys 'n' girls to listen to... 'Sunk Without Trace' by Hank and 'I Love You So Much It Hurts' by Floyd Tillman. You can find them on the little ol' radio on Hank's Media page HERE. Been a while since the last Wangletter. Blessed relief perhaps but just meant that Hank had an extended time off the road and concentrated on recording the new album. And they’ve done it! Finished mixing the sessions at the end of May. Now they need to get the cover designed and the tracks mastered, a process where a “Master” polishes them up to a wondrous audionic shine. So Save Me The Waltz, Hank’s album of Waltzes, is born but needs a little incubation. They recorded in Rock of London a fine analogue studio in Hackney and have achieved a warm fat sound with some real old-style waltzes. There are some special extras with contributions from special guests like Billy Bragg and others. But the real stars are Hank and the Lost Cowboys themselves who were in tremendous form. In fact there are so many waltzes in Country music that it has to be a Double Waltz album. We may put a couple of tracks up on the website as teasers for you. Expect a release in the Autumn. And remember the Waltz is the waymark on the borderline between Rock ‘n Roll and Country. Not a lot of waltzes in Rock but Country is littered with them. And the saddest most miserable songs are often waltzes so you can imagine Hank’s joy playing them. Now we have the sad news of George Jones' death. Here's my obituary for George in the Guardian (CLICK HERE). Meantime I've taken time off the road to dive into recording the new Waltz album Save Me The Waltz (The Wild Wonderful Wayward & Wicked World of Waltzing With Wangford). We're laying it down in Rock of London, a fine and funky studio in the Hackney Road crammed with classic analogue machines for that warm authentic Country sound we in the Lost Cowboys love. We've recorded sixteen new tracks, four originals and twelve covers of favourite Country waltzes that have followed me through my life. The album's true heroes are the Lost Cowboys and it is peppered with special guests I'll let you know about closer to the time. The time? If all goes well I expect to release this Waltzerama in the autumn. 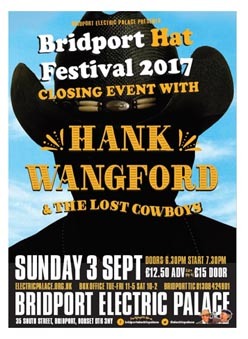 Hank Wangford and Brad Breath will play the 600 seat Speigeltent at this year's Brighton Festival. The duo play Saturday 11th and Sunday 12th May and will have BJ Cole and Jeff Rulf accompanying. Hank welcomes Spanner Robinson, a new voice in the Lost Cowboys. He first saw her in the duo she has with Jeremy Mendonca, Hallelujah Trails and was knocked out by her harmonies. He hopes to feature her harmonies on the projected Waltz album. She will certainly join the Lost Cowboys at selected venues. Watch the listings. 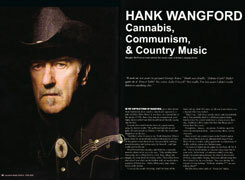 You may have noticed that we've recently tweaked Hank Wangford's website. 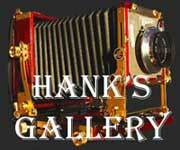 It now includes a slightly modified menu and an all new and singin' GALLERY which includes lots of new photos of Hank. Take a peek HERE. The Olympic flame is currently on its way round Britain. Hank is mortified, as I’m sure you will be too, by the news that it is travelling round Suffolk, through quaint Southwold, on to Reydon an unremarkable village but – shock horror! 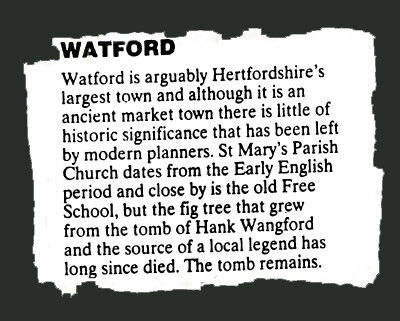 – bypassing Wangford, Hank’s spiritual home. Wangford is a sleepy place and is already bypassed by the A12, the classic Fish Finger run from Lowestoft to London, but this Olympic cold shoulder is one rebuff too many. This is an outrage and if you feel as lacerated by the iniquity of this appalling decision please make your feelings known to your local Olympics committee or write to your MP. Better still go to Southwold at 11.34 on Thursday 5th July to protest at this heartless affront to the great man and his native heath. 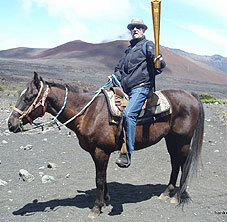 So here (left) Hank conducts his own personal protest taking The Flame into the crater of the great volcano Haleakala, the House of the Sun, on his recent trip to Maui. Before Hank became a full card carrying Hippie, the drugs kicked in and his fashion values disappeared up his William Morris print flares, he was a Mod. Living in Soho in the '60s, married to his agent, Hank was a Mod-suited Satirist when not a medical student. He regularly bought Mod suits from Dougie Millings the Beatles tailor. High collar, four button, waisted. He loved his Ivy League gold and black broad striped jacket he got in Sportique on a very early Carnaby Street. He played the West End in Beyond The Fringe in a Mod suit. He wore a Mod suit down at the All Nighter in The Flamingo listening to RnB from Chris Farlowe, Georgie Fame, Zoot Money, Herbie Goins, John Mayall and even the great Solomon Burke in a defiantly non-Mod salmon pink Lurex suit with emerald Lurex lapels (see Hank's piece on "Negramiculaphilia", the love of Black Men wearing Capes). Even morphing from Mod to Hippie left No Room for Country in Hank's world. Now Hank has reverted big time in a spectacular Late Life Crisis to his beloved Mod roots. Wangford fans have been heard muttering "Where's the Cowboy boots? The Western shirt and jacket? Where's the Stetson, Hank??" All since he discovered Adam of London right on his doorstep near Rancho Wangford on the Portobello Road. "DO YOU WANT TO LOOK LIKE S**T? Adam do fine '60s cut figure fitting suits, coats and shirts. Shiny Two-Tone Tonik mohair! Tab collar and pin-through collars! It's a Mod dream. Or a Madmen dream. My heart attacks me out of the blue...! 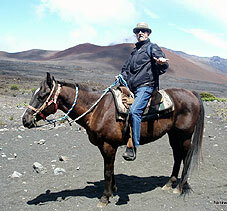 Hank has written about his trip this year to Maui, Hawaii to find the Paniolo, the Hawaiian Cowboys. Certain that no one in the UK has ever heard of the Hawaiian cowboys, Hank has been waiting years to go over and ride with them and hear their special brand of music. He's written about them and an article will apear in the Guardian Travel section on Saturday July 23rd and simultaneously in Guardian Online (the largest online newspaper in the world after the New York Times). That same day, July 23rd, Hank will appear on BBC Radio 4's Excess Baggage at 10 am. If you miss it then you can catch up with BBC iPlayer or download it as a podcast. Later we will post the article and other Hawaiian thoughts from Hank here on Hank's Trails. Kylie Ramone (!) seems to be working overtime and sticking footage on to YouTube as fast as she can get hold of them. Latest is a clip of Hank and the Lost Cowboys playing the Assembly Rooms at the Edinburgh Festival in good ol' 1984. Catch 'em HERE. 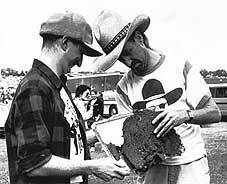 We've added a few images of Bill Pickett which had been put out by the US Mail in 1993. "Click the Bill Pickett picture to see more photos. Sadly, the US Mail got it wrong, and the image is not of Bill himself but his brother. And it wasn't Wilson." 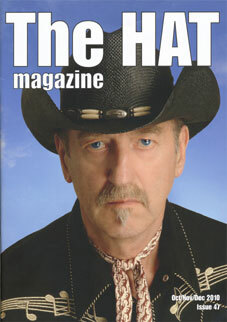 Hank is the cover face for The Hat Magazine latest issue. As a compulsive hat wearer and newly honoured Patron of the Bridport Hat Festival, Hank is pleased and proud. He is happy, too, to see that at last more British citizens are becoming hat-aware again. Here he is wearing a black straw Rancher cowboy classic from Western Express of Bridgeville PA. He bought the hatband in Conway Texas, inspiration to Harold Jenkins for his new stage name Conway Twitty which makes Hank Wangford seem normal by comparison. The band was made by local Comanche Indians using Indian conchos and ersatz bone. Check out The Hat Magazine and Mr Snook in Links. This November Hank will turn 70 before his time so the rest of the world can feel twenty years younger. He will celebrate his 70th birthday weekend with two very special gigs. In West London on Sunday 14th November he will be at the Half Moon Putney for his Birthday Prequel and on Monday 15th November Hank will celebrate his Actual Birthday in his homeland North London at the O2 Academy in Islington. On both nights he will have a clutch of special guests joining the Lost Cowboys to help him through the pain of three score and ten. The legendary Brad Breath – Andy Roberts – will be yodelling into your hearts and offering you a Glimpse of Gloom on both nights. Despite the party atmosphere and whatever guests turn up Hank pledges as always to keep the proceedings miserable. And Keep It Country! 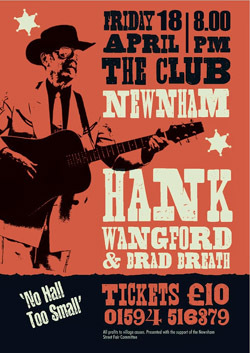 Hank Wangford & Brad Breath kick off their nationwide (Dorset - the county) tour this weekend with several No Hall 2 Small gigs. Catch them at Puddletown, Ibberton, and Wootton Fitzpaine over the weekend. We have a taster for all you fans of misery HERE. Hank will appear on GMTV's 'This Morning' show tomorrow morning (Monday 2nd August) as judge and jury for a Celebrity Cowpat Flinging contest. Hank, of course, is one of the countries leading experts and once officiated at Edinburgh Festival with the Hank Wangford $incere Product$ International Pro Celebrity Cowpat Flinging Contest with Billy Bragg (see photo). You can catch 'This Morning' at 10.30 on ITV. New additions to the site are both sides to Hanks single from 1968 when he was recording under the name of Boeing Duveen and the Beautiful Soup. The tracks are the A-side, 'Jabberwock' and the B-side 'Which Dreamed it'. The single is one of RECORD COLLECTOR'S Top One Hundred psychedelic recordings of all time. We also have the tracks 'Anyway' and 'Lizzie' which Hank recorded with The Bhundu Boys, the Zimbabwean Jit band, in 1992. The tracks are from the album 'Friends on the Road', released in 1993. Listen to all HERE. The Academy in Islington is offering tickets for Wangford fans for half price. So if you want to come next Saturday to see Hank and the Lost Cowboys with the Tennessee Three follow the link below and give them the password "hankie". That way you'll be able to buy your way in for £10 and not £20! This is for Wangford fans only. That's you! 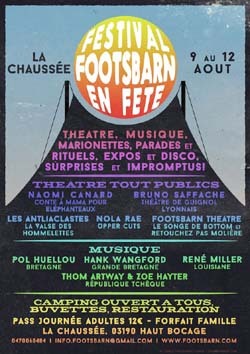 HERE'S THE LINK..... PS: Hank and the Cowboys take to the stage at 7.15 - so get there early!! This month's 'Song Of The Month' is the man himself with The Lost Cowboys from way back in 1983 playing at the Peterborough Festival of Country Music. Hank and the Cowboys are playing "Cowboys Stay On Longer". CLICK HERE TO SAMPLE SOME STONKIN' MUSIC. It’s quiet times for Hank & The Lost Cowboys. We’re all separately busy with Martin and Kevin just back from extensive Swedish touring with Ducks Deluxe and along with BJ soon going to the Isle of Man. BJ is playing amongst others with Brian Eno around the country and Hank is still struggling with his “No Hall Too Small” book. The great news is that after an upswelling of local opinion and a takeover by Carrie and Jamie the Half Moon Putney has been reprieved. So last December’s gig was not our last. Tribute bands will be given the bum’s rush and a new forward looking booking policy is in place. Friday nights - our night for a while – is now indie band and DJing night until two in the morning. We are moving to Sundays which will be at the normal time, playing until eleven and not closing early. So everyone on the London music scene is delighted that for once the inevitable march of accountants, auditors and gastropubs has been diverted and one of London’s historic music venues (Rolling Stones, Who, U2, KD Lang, Ralph McTell etc etc) continues to thrive. We've added a new feature to the site. You can take a peep at Hank's 'Song Of The Month' here. This month the featured artists Floyd Tillman with Hank Garland "Slipping Around". We'll be adding new videos of Hank and the Lost Cowboys soon, so keep tuned! Hank sends his New Year thoughts to all website visitors, with his latest blogeen. For the uninitiated, a Bloggeen is a shortened version of a Blog (Of course it is)!! Read it here at HankWangford.com/newsletter. Since having been divorced by Reg Meuross in the summer of 2009 Hank has joined up with his old musical buddy and saddlepal Brad Breath aka Andy Roberts. Together they will come back to the rural arts touring round village halls that Hank loves so much and will do the smaller gigs that are too small or low paid for the whole Lost Cowboys posse. Big and small we love them all and will find a format to suit your venue. Misery and melody, raw emotion and open ribcages will continue to be our trademark whatever form we take. Hank will forever be the High Prince of Pain and offer his unique Glimpse of Gloom whoever he is playing with. Divorce, a double edged knife, brings sadness and pain mixed with overwhelming joy and Hank as a new divorcee looks forward to meeting and greeting more of life's rejects out on the never ending road. Keep Yodelling through it all! CLICK HERE TO CHECK OUT THE NEW HANK & BRAD PAGE!! The Half Moon in Putney is closing in January 2010. It seems the brewery wants to convert it to a gastropub, smarten it up and stop it being a music venue. So big news for us is SUNDAY 20 IS OUR LAST GIG EVER AT THE HALF MOON. Come and sob uncontrollably with us. Christmas is as always a time for tears and knife in the heart sadness. So join Hank & Martin & Kevin & BJ & Roy for the final Half Moon. LATEST: The Half Moon is SAVED!!! Hank is pleased to announce that after lots of requests, HankWangford.com now includes lyrics to a handful of his songs. We'll be adding more and more over the next few months, so STAY TUNED!. See Hank's lyrics here. 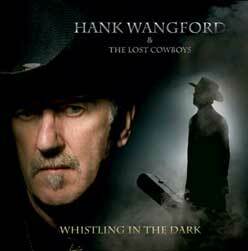 The distribution company for "Whistling in the Dark" has completely sold out of the first run of Hank's album. A big 'thank you' to everyone who has bought the album. A new batch has been ordered and should be in the shops in the next few days. album, "Whistling in the Dark" on its long haul Transatlantic flights to the USA and Canada. AOL have destroyed Hank's email account for no reason. wangford99@aol.com is no more. To contact Hank for bookings, mailing list enquiries and such go to the guestbook here on the website or email hankwangford@gmail.com. The AOL account is a black hole and you will get no response. Hank warns "Stay away from AOL. They are dangerous and unreliable." Due to unforeseen circumstances, Hank Wangford and the Lost Cowboys won't be appearing at this year's Maverick Festival, but Hank and the Band will be at the Festival in 2010. You can grab your tickets for this year's event from the Maverick website. FLY TRANSATLANTIC HANK! British Airways has recently added Hank's new album, "Whistling in the Dark" on its long haul Transatlantic flights on the Country music selection. Hank's email account with AOL has died a death and we are in the process of reconfiguring a new address. In the meantime, if patrons, record company barons and promoters would like to get in touch, please use the guestbook. Hank and the Lost Cowboys have recorded a session for Mark Lamarr's "God's Own Jukebox". They have recorded five songs, four from Whistling in the Dark and Nothing Left from Best Foot Forward. There will be a version of Jealousy from Whistling on the BBC website for a full month from 28th February. The other tracks, along with chat with the Lost Cowboys and a selection of their choices of inspirational tracks, will be on Mark's Jukebox on BBC Radio 2 at midnight on Friday 27th into Saturday morning until 3 o'clock. For the elderly and infirm Wangford fan and the Wangford diaspora overseas the whole programme will be available on the Internet on the BBCs Listen Again service on www.bbc.co.uk for a full week after the programme. The latest edition of MOJO has Hank's 'Little Bird' as No.6 on it's TOP TEN playlist!!! Hank's new CD, recorded with the Lost Cowboys: Whistling in the Dark is now available at gigs and in all good record shops!